“Well, I tried, but with your credit, this is the best we can do.” The salesman slid a scrap of paper across his desk. The number scrawled on it was still more than I could afford. I wiped the tears from my eyes, trying not to smudge my mascara as I glanced over at my kids. After two hours at the dealership, they were high off vending-machine candy, attempting to make a fort from the chairs in the showroom. I needed to make a decision. My ex-husband had stopped making payments on our Jeep, and it would be repossessed any day. I needed a car. “OK,” I shrugged. He shook my hand. An hour of paperwork later, I walked out feeling like I had just been duped. How had I let this salesman talk me into a car I didn’t like and a payment I couldn’t afford? I vowed to never let it happen again. Since then I learned how dealerships work and how to use their own strategies against them. I’ve leased three vehicles at unheard-of prices and purchased a car at $4,000 below manufacturer’s suggested retail price, or MSRP. To beat them at their own game, you will need information, preparation, and negotiation. Decide on a maximum, affordable monthly payment. 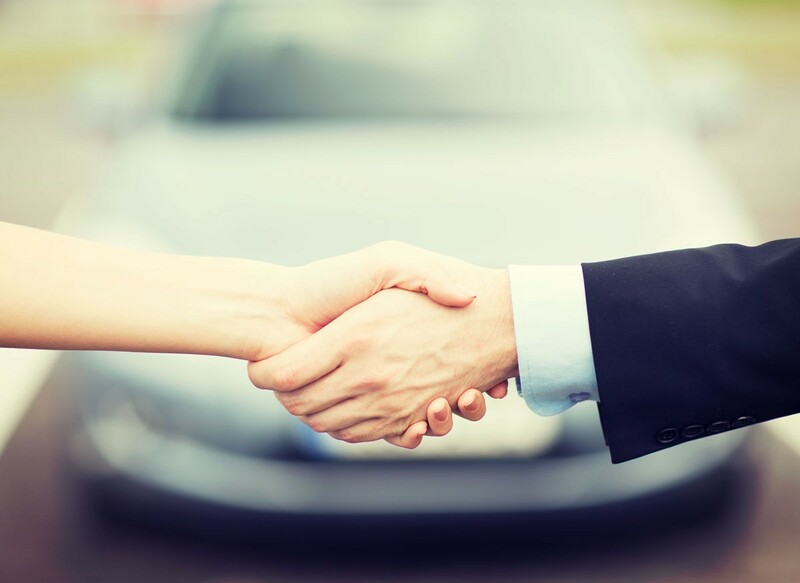 If you’re buying a car outright, decide on a maximum purchase price. Check your credit score(s) for free at Credit Karma. Research online. Narrow down the vehicle type and brand. Compare features side by side on car-brand websites. They often require your email and phone number. You can set up a temporary Gmail account and enter a dealership phone number to avoid annoying sales calls. Use Kelley Blue Book or TrueCar to determine the value of your chosen vehicle. Print the info to bring to the dealership. Ask a friend to join you at the dealership for moral support, and don’t bring the kids. Go at the end of the month, preferably in fall or winter. Dealerships are motivated to clear stock to make room for new model-year vehicles. If you are buying with a loan, remember the three key factors: interest rate, down payment, and term (how many months you will pay). Don’t be fooled when they propose a lower payment but more months. To lower your cost: get a lower interest rate, or put down a bigger down payment. Contrary to popular belief, dealers have a lot of wiggle room on interest rates. When they come back with an offer, do this calculation: [# of months] x [monthly payment] + [down payment] = [total cost]. If you are leasing, there is no interest on leases, so put down the lowest down payment possible (or nothing), unless of course you’re trying to lower your monthly payment. You don’t save money on a lease by putting down a big down payment. You save money by negotiating a lower monthly payment. Consider mileage. Standard lease mileage allowance is 12,000 per year. I always negotiate up to 15,000 miles to avoid being charged over-mileage fees at the end of my lease. It’s time to set aside emotions and get your head in the game. You already know the salesperson will use every trick he or she can. Now use your own tactics. Think of it as a game with three levels to defeat. For lease payments: Start negotiations by stating that you want a payment $50 to $75 below your maximum monthly budget (this gives you negotiation room without going over your budget). Never tell the salesperson what your true maximum budget is. The salesperson will take your offer to the manager and likely come back with a figure higher than your maximum budget. For purchase price: Start negotiations by stating you want a price at least $2,000 to $4,000 lower than the Kelley Blue Book value of the car. Keep saying no to any prices that are over your budget. It’s better not to give a reason; just say the price doesn’t work for you. Be firm. Then the sales manager will come over. Level 2: Sales manager/bad cop. The sales manager may try to downplay your credit, your income, your options—anything he or she can do to make you feel like you don’t deserve the best deal. Ignore these ploys; keep emotions out of it, and focus only on the numbers. Keep saying no until they get to the price you wanted all along. Never be afraid to leave if you feel too pressured or if the dealership doesn’t agree on price. You can always try another dealership. I once left a dealership, and the salesperson ran out to the street to finally accept my price. Level 3: Finance manager/salesperson-in-disguise. Once you agree on a price, you’ll head to the finance office. This person may come across as helpful, but keep your guard up. They get commissions on any extras they sell you. Just say no to add-ons. You’ve got this! Remember this is just a transaction, a vehicle. Keep that mindset until you’re done. You can celebrate once you have the deal you want on the car you want.